With OMD once again participating in Record Store Day this April, it’s probably a good time to look at the event and to explore what it means for shops, bands and indeed the fans themselves. Record Store Day originally began in 2007 as a joint effort by independent record stores to encourage people to buy records from the shops themselves. In the face of declining high street sales and cheaper online outlets (not to mention bit torrent and pirating in general) this seemed like a shrewd move at the time. On the surface, the process makes a lot of sense. The record shops get to sell more records and the participating bands and record labels benefit from a higher public profile. This is largely down to the fact that RSD releases tend to be specially pressed editions that offer unusual or rare tracks and are thus enticing to the record collector market. There are a number of issues that have arisen in recent years however that have attracted criticism of the event. This includes concern over the involvement of major record labels and the sheer number of records now being issued for every Record Store Day (in 2011 there were 277 but by 2014 there were 643). The chief complaint amongst many music fans however is getting access to the records they want in the first place. The very collectability of the records tends to attract scalpers. Post-RSD, many of these releases skyrocket in value due to their limited numbers and it’s no surprise therefore to see records turn up on eBay with a mark-up considerably in excess of the retail value. 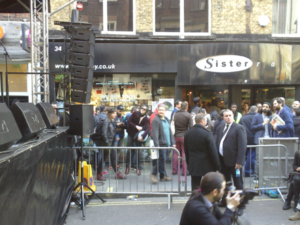 The result of this is disgruntled fans who are angry at having to queue up at shops for records – records that they might not even get (shops usually only get limited numbers – and don’t stock everything listed on the RSD inventory). Seeing those records then turn up online for exorbitant prices just adds fuel to the fire. Unfortunately, it’s difficult to conceive of a solution that would benefit everyone. The fact that the records are collectible items to begin with creates the market that attracts both collectors and scalpers. Plus, outlets such as eBay have been thriving off high priced collectable records since its inception. The reliance on vinyl as the main format of choice also introduces its own issues. There are now only limited pressing outlets that can accommodate vinyl production, which are inevitably over-subscribed in the months before Record Store Day. The result is that many independent record labels often struggle to get their regular stock pressed due to the overload. The recent revival of interest in vinyl is also concerning as a separate issue. It leads to a perpetuation of the many myths regarding the quality of sound formats, particularly the misinformation about the formats used for CDs and also the myth that all alternative file formats are super-compressed. Record labels aren’t that concerned with these issues as they know they can profit more from vinyl than CD due to the mark-up on vinyl releases being up to 3 times more than CD. Not that there’s anything inherently wrong with issuing special releases in different formats. Most RSD releases of note are a package deal that can incorporate rare tracks, but can also be issued with special artwork or packaging. 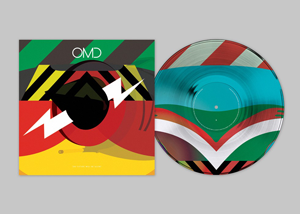 In 2013, for OMD, this came in the form of a 10” picture disc release of ‘The Future Will Be Silent’. Originally released on the English Electric album, this item came packaged in a specially designed sleeve conjured up by OMD designer Tom Skipp: “I’ve mixed the English Electric Lightning jet fighter’s distinct nose with the EE Deltic train’s decals. Describing an English Electric modern dream where the future will be silent. The 10″ format is such a great canvas to explore this future with the past”. The release of ‘The Future Will Be Silent’ certainly stirred up debate online with fans either celebrating sourcing a copy – or loudly complaining at seeing copies turn up on eBay for inflated prices. The record still does the rounds today averaging at around £30-£40 a copy. For 2015, OMD have contributed yet another 10” release, this time in theme with the recent Junk Culture reissue. ‘Julia’s Song (Dub Version)’ is apparently a previously unheard mix and has been culled from the brass version that features the Weir Brothers. To top it off, the record has been issued in a sleeve that incorporates the design elements used on Peter Saville’s original sleeve artwork for Junk Culture. It’s also worth noting that Erasure will be issuing a special limited edition 12″ EP of remixes culled from their new album The Violet Flame. This includes a mix of ‘Be The One’ by Paul Humphreys. 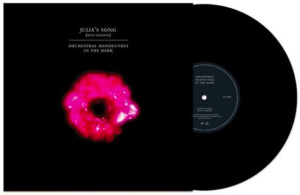 It’s very probable that RSD will once again see OMD fans both happy at sourcing copies of the ‘Julia’s Song’ 10” and also complaining at being unable to get their hands on one. Although no satisfactory solution to these issues is likely at present, it can’t be argued that the event has at least stirred up debate. In a time where record shops are struggling to survive in the wake of online outlets, such as Amazon, this is quite an important discussion. It also suggests that people still have a strong emotional connection with the music. The passionate responses and heated debate are the perfect antidote to the claims that people have become to treat music as merely aural wallpaper. The Julia’s Song 10″ will be a limited edition release (1,000 copies) and available on Record Store Day at participating outlets 18th April 2015.